It's been a while since I posted, a lot of stuff has been going on in my life and I've been sick as well, so I didn't have the energy to keep up to date with blogging and other sites. I won't be able to post here or reply to other blogs much in the next weeks either, but I hope things calm down in the new year! 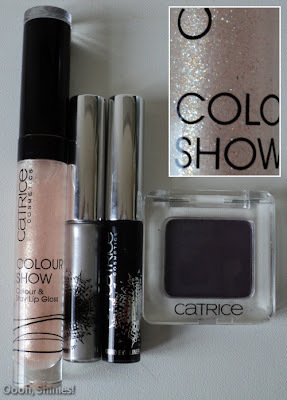 Today I have several things to show you, starting with some review products from Catrice. As you might have read on other blogs, Catrice recently held a press presentation and invited a bunch of bloggers as well. Unfortunately I couldn't make it, but not long after I got a lot of information from them about all the new stuff, and they were so kind to add some products to test as well! Normally I don't post about anything but polish, but today I'll make an exception to show the products I received. The lipgloss is Toast With Champagne, the eyeliners are from their Glamourama collection, and the eyeshadow is Heidi Plum. As always, the picture is clickable for a bit bigger version, which shows the sparkle in the gloss better. The gloss seemed a bit too sparkly for my liking, but on my skin it's mainly just glossy with a fine sparkle, as you can see here. It has a sweet scent which caught the attention of my kitten, lol. 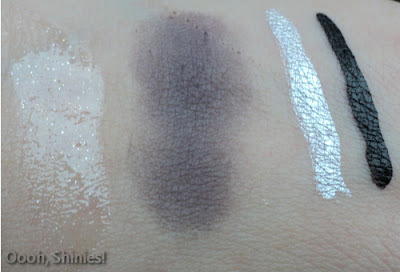 The eyeshadow was very pigmented, but I haven't tried it on yet besides on my hand here. The silver eyeliner seemed a bit thin and less pigmented than the black one, but when it dried up that didn't show anymore. There was also a polish in the package, The Devil Wears Red, and the first thing I noticed was that they changed the color of the text on the bottle. That used to be black, making it hard to read on dark polishes, and now it's grey with the name of the polish in white. Much better if you ask me! 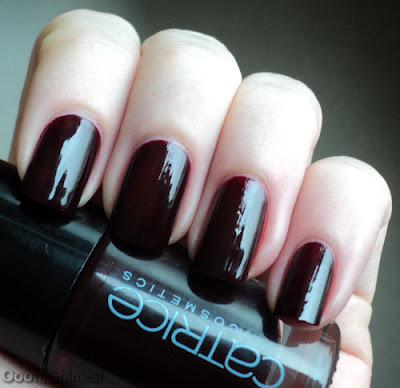 I used 2 coats here, no top coat. This was 2 coats with a layer of top coat. Thanks for stopping by and take care! 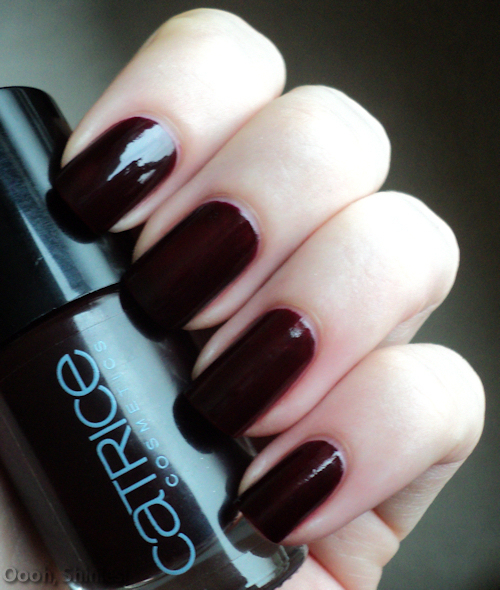 You can buy the Catrice products in stores like Kruidvat. 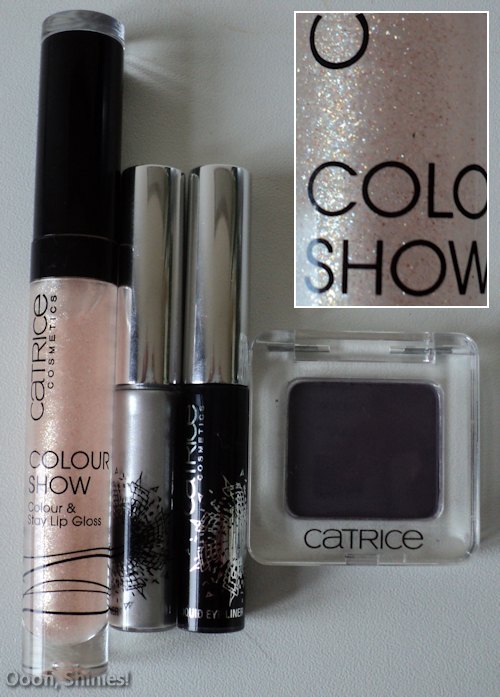 The lipgloss costs €3,79, the eyeshadow €2,79 and the polishes sell for €2,49. I'm not sure on the price of the eyeliners.